Biomass is biological material derived from living, or recently living organisms. It most often refers to plants or plant-based materials which are specifically called lignocellulosic biomass. As an energy source, biomass can either be used directly via combustion to produce heat, or indirectly after converting it to various forms of biofuel. Conversion of biomass to biofuel can be achieved by different methods which are broadly classified into: thermal, chemical, andbiochemical methods. Wood remains the largest biomass energy source to date; examples include forest residues (such as dead trees, branches and tree stumps), yard clippings, wood chips and even municipal solid waste. In the second sense, biomass includes plant or animal matter that can be converted into fibers or other industrial chemicals, including biofuels. Industrial biomass can be grown from numerous types of plantsincluding miscanthus, switchgrass, hemp, corn, poplar, willow,sorghum, sugarcane, bamboo, and a variety of tree species, ranging from eucalyptus to oil palm (palm oil). Bioenergy is renewable energy made available from materials derived from biological sources. Though wood is still our largest biomass energy resource, the other sources which can be utilized include plants, residues from agriculture or forestry, and the organic component of municipal and industrial wastes. Even the fumes from landfills can be used as a biomass energy source. Biohydrogen is a potential biofuel obtainable from both cultivation and from waste organic materials. Though hydrogen is produced from non-renewable technologies such as steam reformation of natural gas (~50% of global H2 supply), petroleum refining (~30%) and gasification of coal (~20%), green algae (including Chlamydomonas reinhardtii) and cyanobacteria offer an alternative route to renewable H2 production. Steam reforming of methane (biogas) produced by anaerobic digestion of organic waste, can be utilized for biohydrogen as well. Bioplastics are any plastic material that is either biobased, biodegradable, or features both properties. They are derived from renewable biomass sources, such as vegetable fats and oils, corn starch, or microbiota. Bioelectricity is the production of electric potentials and currents within/by living organisms. Bioelectric potentials are generated by a variety of biological processes and generally range in strength from one to a few hundred millivolts. The global market for Biogas production equipment like anaerobic digesters and landfill gas equipment is estimated at nearly $4.5 billion for 2013. The market is projected to reach $7 billion by 2018 growing at a compound annual growth rate (CAGR) of 9.4% over the five-year period from 2013 to 2018. Renewable energy and energy efficiency are sometimes said to be the "twin pillars" of sustainable energy policy. Both resources must be developed in order to stabilize and reduce carbon dioxide emissions. There are various energy policies on a global scale in relation to energy exploration, production and consumption, ranging from commodities companies to automobile manufacturers to wind and solar producers and industry associations. Recent focus of energy economics includes the following issues: Climate change and climate policy, sustainability, energy markets and economic growth, economics of energy infrastructure, energy and environmental law and policies and global warming along with exploring various challenges associated with accelerating the diffusion of renewable energy technologies in developing countries. Most of the agricultural facilities in the developed world are mechanized due to rural electrification. Rural electrification has produced significant productivity gains, but it also uses a lot of energy. For this and other reasons (such as transport costs) in a low-carbon society, rural areas would need available supplies of renewably produced electricity. The United Nations Environment Programme (UNEP) has defined green economy as one that results in improved human well-being and social equity, while significantly reducing environmental risks and ecological scarcities. In its simplest expression, a green economy can be thought of as one which is low carbon, resource efficient and socially inclusive. It is closely related with ecological economics, but has a more politically applied focus. A low-carbon economy (LCE) also known as low-fossil-fuel economy (LFFE), or decarbonised economy is an economy based on low carbon power sources that therefore has a minimal output of greenhouse gas (GHG) emissions into the environment biosphere, but specifically refers to the greenhouse gas carbon dioxide. GHG emissions due to anthropogenic (human) activity are increasingly either causing climate change (global warming) or making climate change worse. Green technology is also used to describe sustainable energy generation technologies such as photovoltaic, wind turbines, bioreactors, etc. with an ultimate goal of sustainable development. Its main objective is to find ways to create new technologies in such a way that they do not damage or deplete the planet’s natural resources and aid in the reduction of global warming, greenhouse effect, pollution and climate change. The global reduction of greenhouse gases is dependent on the adoption of energy conservation technologies at the industrial level as well as this clean energy generation. That includes using unleaded gasoline, solar energy and alternative fuel vehicles, including plug-in hybrid and hybrid electric vehicles. Power Engineering is a subfield of Energy Engineering and Electrical Engineering that arrangements with the generation, transmission, dispersion and usage of electric force and the electrical gadgets associated with such frameworks including generators, engines and transformers. However a great part of the field is worried with the issues of three-phase AC power – the standard for generous scale power generation, transmission and dissemination over the cutting edge world – a noteworthy division of the field is worried with the change between AC and DC power and the improvement of particular power systems for example, those utilized in aircraft or for electric railway networks. The Power Systems were getting more productive with taking a break and have turned into a centre region of Electrical Engineering field. Nanotechnology is a subject which has been popular within the scientific and technology industries for many years. It is now with the ever growing advancement in technology that nanotechnology is picking up the pace and has got a lot of people talking. Now, engineers are studying ways that it can be made beneficial to the environment. This has been branded as 'green nanotechnology' since it focuses on challenges within the nanoscale that need to be overcome to ensure eco-friendly processes and products. The objectives of nanotechnology are to create eco-friendly designs with nanotechnology and use it to reduce health and environmental hazards by seeking methods to replace present applications with green nanotechnology products. Energy materials within the past meant high energy explosive materials utilized in detonation and alternative energy storage applications, such energy cannot be regulated for extended period. Currently energy materials embody wide selection of advanced and novel materials for the generation and storage of electric power. Energy generation, management and distribution are the quickest evolving industries of recent times. The demand to develop parts and sub-assemblies for novel product across the energy sector is increasing. Analysis in Production of electricity from piezoelectric materials, Biomass, photo chemistry is studied widely in several universities. Energy is deposited in a range of energy sources, which can be non-renewable or renewable. Renewable sources of energy are those that can be refilled in a short period of time, as opposed to non-renewable sources of energy.The use of renewable sources of energy is less polluting, compared to that of non-renewable sources. Specifically, increased dependence on renewable sources of energy is a key element of efforts to avert climate change. Renewable sources of energy today make an irrelevant contribution to total energy use, compared to that of non-renewable sources. A range of barriers hamper the widespread deployment of renewable energy technologies. 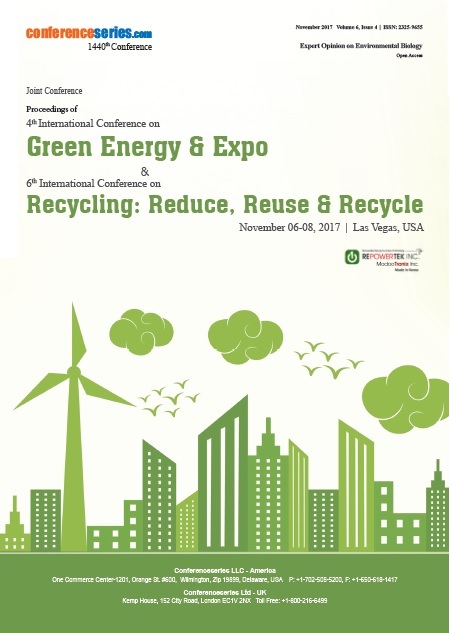 Green Energy- 2018 facilitates a unique platform for transforming potential ideas into great business. The present meeting/ conference creates a global platform to connect global Entrepreneurs, Proposers and the Investors in the field of Renewable Energy and its allied sciences. This investment meet facilitates the most optimized and viable business for engaging people in to constructive discussions, evaluation and execution of promising business. 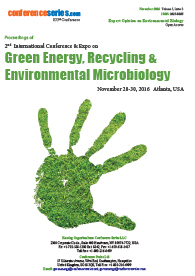 Participants are welcomed to submit abstracts relevant to the following theme/ topics or to combinations of them. All topics can be related to policy, market and technological issues as well. 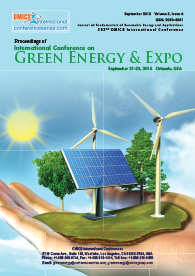 ""Renewable Energy for a Sustainable World"